The answer is yes; here’s a quick example. It was also nice to talk to you too. We haven’t see you for a while. I hope you are enjoying your oversea experience. I sometimes read your blogs, to see how you we doing. Yes sometimes I wish I could hear your critiques, especially when I did good :). Your critiques were short, to the point, emphasizing important accomplishments, and sometimes not too enjoyable but helpful. Thank you for sending me this post. Whew! It sounds like I was doing my job correctly. Part of that job is to help students learn to evaluate their strengths and weaknesses. I’ve got to challenge them to address weaknesses I see. Effective teaching requires a careful balance of challenge and support (Sanford, 1962). I aim to provide that and to help students reach just a bit farther than they are comfortable doing (this is called a “plus-one” approach to teaching). 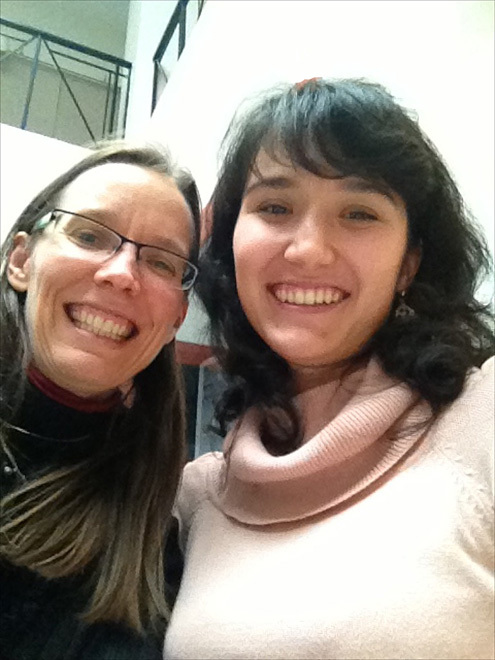 Good students, like Iroda, recognize that challenges are presented to help them grow and that the professor’s main role is to help guide them in their own learning. Receiving critique is never pain free, but it is necessary for growth and development. Thanks for your note, Iroda! You always do excellent work. I wanted to make sure to help you reach for the stars, though. You’re really terrific at technical ways of thinking. As a second-year instructor, my job is to try to help students develop fluency in multiple ways of thinking… particularly the ways they find foreign or uncomfortable. 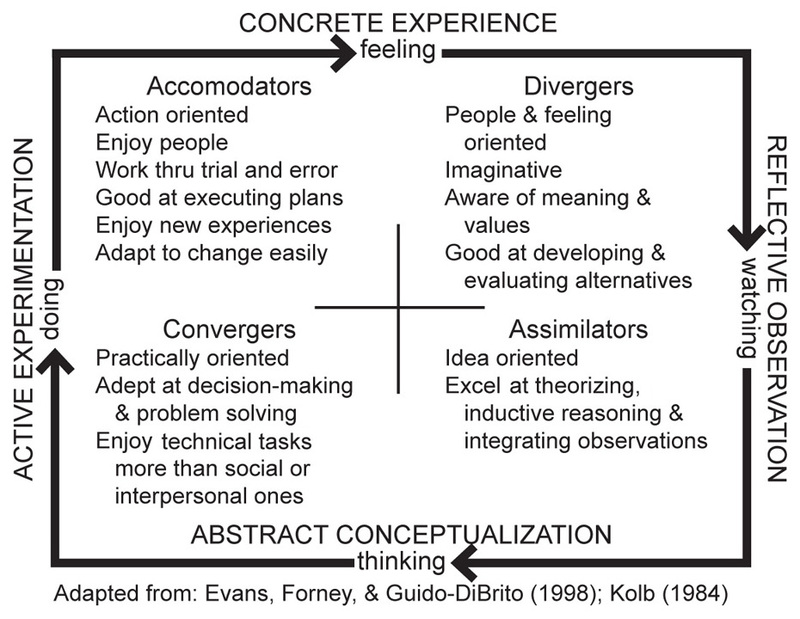 I’ve attached a chart to explain (it’s from a paper I was working on Tuesday). Most students come to college very good at one corner/quadrant of the chart. You were exceptionally good at Convergent thinking. I’d say you left second year with new skills in that realm, but more importantly, with new skills in the other three quadrants as well. CHANCE, S.M. (2010).Writing architecture: The role of process journals in architectural education. MADE: Design education and the art of making (160‐170). Charlotte, NC: College of Arts + Architecture. 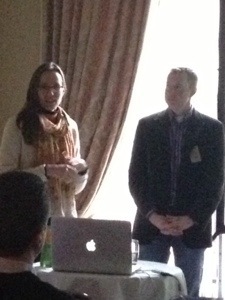 Presented at the 26th National Conference on the Beginning Design Student in Charlotte, NC. A video of a past RoboSumo competition is available to view at by clicking here. The competition is just getting underway now for this year… in fact, there’s still time to register for the DIT class! One of the things I have been studying here in Dublin is the use of hands-on projects to teach engineering. One example is a very popular electrical engineering course at DIT called RoboSumo. Suffice it to say, the whole program gets jazzed up about RoboSumo events. Even the Dean (Dr. Mike Murphy) can be seen in the video of the final competition. Two robots compete in each bout, each trying to stay in the arena longer than the other robot. Robots are encouraged but not obliged to actively push their opponent out of the arena. … The bout ends either when a robot leaves the arena or once 1 minute has elapsed, whichever occurs first. If only one robot remains in the arena at the end of the bout, that robot is the winner. 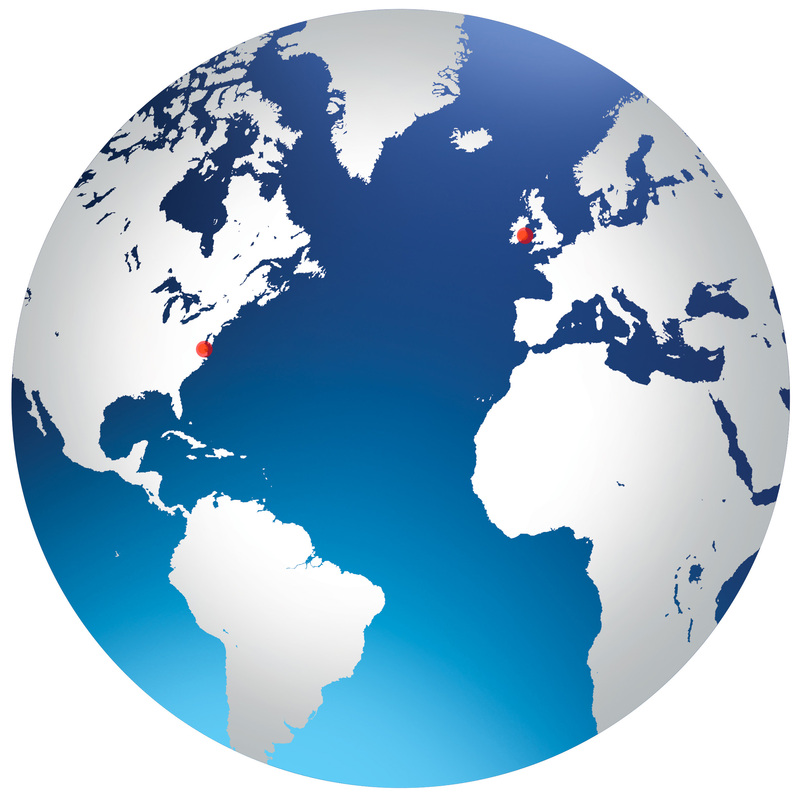 The RoboSumo home page can be viewed by clicking here. Bemis lawn with Bemis Laboratories to the right, home of the Hampton University Department of Architecture. I almost forgot to show you my January 2013 visit to Hampton University. The semester starts earlier there than at most universities, so I had the chance to visit before returning to Dublin, and while HU classes were in session. That way I could see my students as well as other professors. I snapped some photos along the way of things that caught my eye…. Everything seemed the same, until I got to the main stair. I never expected to see a big photo of myself mounted in this prominent location! I caught up with many of my former students. All these folks have travelled with me to Italy: Ed Glover, Alex Taylor, prof. Mason Andrews, and Sharlita Green. One of students garnered a donation of plotters from HP. Way to go! …with its grande central stair wrapped by a third-floor track for running. Our campus has such rich history — architecturally, socially, and culturally. I wandered around campus delivering Christmas presents. Here’s our lovely Trustee House. In my opinion, good city buildings touch each other and define the street. They don’t have to be glamorous to make good urban fabric. When building work together, they create good spaces for people to enjoy. I’ll give two quick examples of clearly defined streets. These two streets are near my apartment in Dublin. Unfortunately, they are both designed for cars–not people. Nevertheless, the buildings work together to define space. 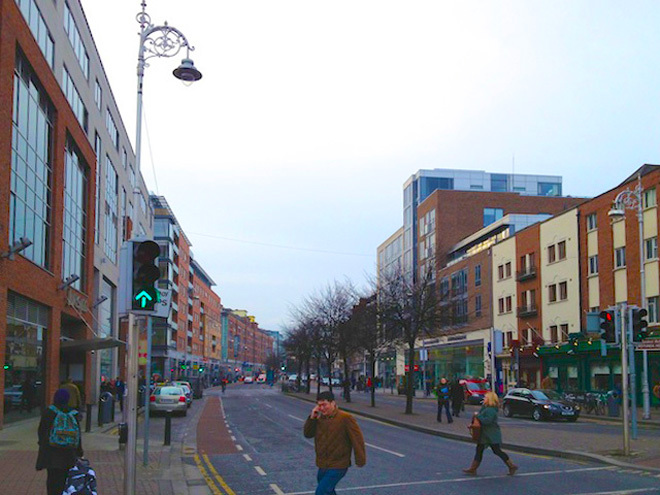 On Parnell Street, the buildings support a good mix of uses and are close enough together to provide the density of population needed to support ground-floor retail. Residential density is lower a few blocks away, on North King, and ground-floor business are fledgling. 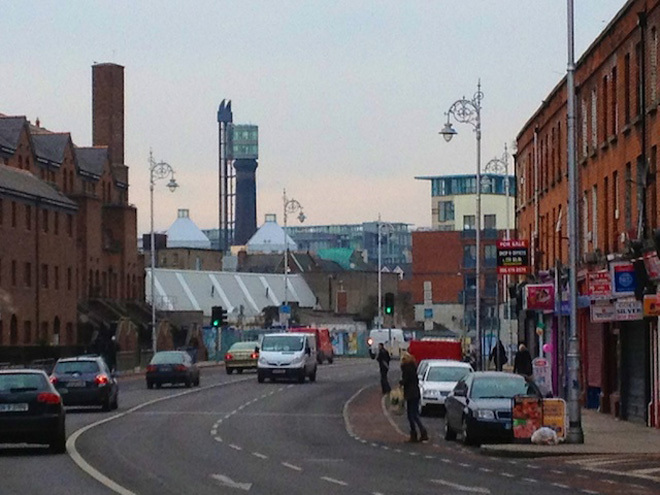 North King Street — view toward the Jameson Distillery smokestack — at the point where density breaks down. Simply put, a proper mix of residential and office space is necessary to support ground floor restaurants and retail. By providing residential as well as working space, mixed-use districts are active throughout the day. Businesses can draw customers morning, noon, and night. I was reminded of all this last Thursday, when I travelled to the Fulbright office in Ballsbridge to help interview Fulbright applicants. It’s in the outskirts of Dublin. Although this is a suburban neighborhood, it is still dense by US standards. Notice that there’s more space between buildings in Ballsbridge than in Dublin city center, but that there’s still a good mix of uses/services. Nevertheless, some buildings contribute much more to the life of the street than others! The American Embassy is located on the main street through Ballsbridge. It acts like a fortress, guarded against and offering little to the street. The older buildings do a much better job of defining the street and making places for people. Overall, Ballsbridge offers an eclectic mix of buildings. Attached, single family homes snuggled up aside the neighborhood post office. The new residential buildings serve to increase density. I’ve always liked this particular building with its heavy base and festive cladding. It even fits decently among the buildings on its block. Nearby, this building ignores the street entirely. It offers the pedestrian nothing and it makes no attempt to communicate with other buildings. What a dreary situation! I had forgotten the sports staduim was so close to the Fulbright Office (which is just around the corner). …but at least it offers intrigue and a place to sit in the sun. …as well as one-story versions. I’m sitting at my computer in Dublin today, working on papers for two different conferences. A video just appeared on my Facebook feed to brighten my day! My nephews Christopher and David are helping their little brother Tommy shore up his walking skills. Tommy took his first steps just about an hour after we left their house one week ago. Interestingly, Christopher did the same thing two years earlier–taking his first steps while we were in transit home. The interior offered a place to dry, warm, and calm myself (and my nerves — the hail had pelted me feircly). I sat by the fire… but on the way out I discovered good craic at the bar. Tony was a police officer in Santa Barbara for years. Today he’s the barman at Kate Daly’s in Limerick. The man in the front here is Welsh and is one of 22 kids (his mother bore 24 children and a whopping 22 of them lived). HIs son, in in the background, was born in Ireland of an Irish mother and is one of six kids; he says he has 80 first cousins! I’d kept to myself yesterday when I arrived at Kate Daly’s pub. When I entered, I was cold and drenched. The hail, rain, and wind had just pelted me into a corner of the castle wall (I was looking for an entrance, but alas the castle is completely closed for renovation). Finding no way in, I had little choice but turn back. I’d snapped some images of Kate Daly’s pub before making that fateful turn toward the bridge off King’s Island. When I saw the pub, I mused to myself that people were drinking at this time of day, and I proceeded onward. But after the pelting I’d just taken, the pub seemed to offer warmth and hope for survival. But the place was warm and quite. The men — all men — clustered around the bar were wide-eyed when I burst through the door. I’d requested hot tea but was told they had none. My purchase of a Blumer’s (by the bottle — a fairly costly choice), secured me a seat at the pub. The bar man suggested I’d be comfortable by the fire. I embraced the suggestion, peeled out of my wet outer garments, and made myself at home. I sat there for a long, long while. The faces people at the bar changed over time, but the composition and number remained steady. With sun rays intermittently shining through the clouds (As they normally do in Ireland), I determined it was time to leave. After all, I needed some food to offset the effects of that cider! On the way to the door, however, the men at the bar posed a few friendly questions. And that set things right — it’s not usual to leave a pub here without partaking in some friendly chatter. I’d felt okay taking the role of a tourist today, but it didn’t seem entirely right given my interest in fitting in here. So I jumped right in and enjoyed some craic. And, boy, did I mean a host of characters! The folks in the photos above were key players in the banter. We had fun. I eventually declined the (inevitable) offer of another drink and slipped out into a (different) moment of sunshine on my way to find food. Before I found anything edible, however, I came across some picturesque reflections and attended a lecture at the Hunt Museum on “upcycling” discarded items into artworks and usable objects. The lecture was sponsored by Limerick’s Tidy Towns committee and delivered by a woman named Mary (another Hail Mary I discovered yesterday in Limerick!). I left Kate Daly’s pub and discovered this reflection just moments before my iPhone battery died. The blogging I did with in in Kate Daly’s drained it…. Although I spent Monday in bed, I lived vicariously through my sister. 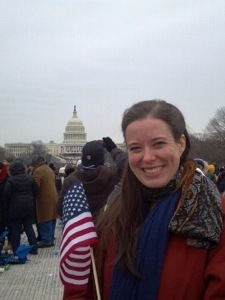 Heather drove from New York to DC to witness another historic inauguration and hear Mr. Obama’s address. Thanks for representing our little branch of the family, Sis! 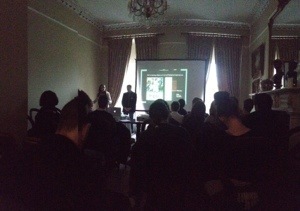 Gavin and I successfully presented our work today in Limerick at the 2nd annual conference of the All Ireland Architectural Research Group (AIARG). Got up at five to catch the train so we could finalize the presentation. David Leatherborrow delivered the keynote address on Louis Kahn. It’s a lecture that I missed when he gave it at the National Conference on the Beginning Design Student in 2010. (I had to catch my flight). Some opportunities do come again and get better over time. That was part of his message: beginning again, over and over, approaching the issues slowly and being open to emerging opportunities made Kahn’s design work great. 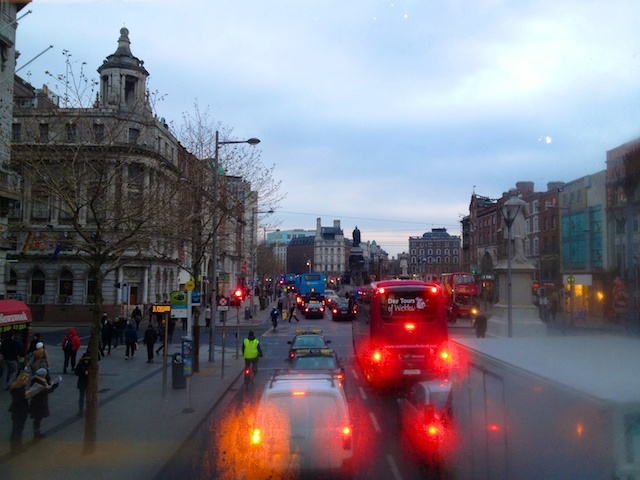 The weather was chilly this morning as I boarded the bus at O’Connell Street to go interview potential Fulbrighters — but it was much warmer than in much of the USA! …when I downloaded these images last night, it was five hours later in Dublin than at home, and of course much farther north as well. Like Portsmouth, Dublin rarely sees snow. When a dusting comes, it quickly dissolves. Both places near the brink of calamity with the slightest hint of ice or snow. The cities and drivers simply aren’t prepared to deal with it. What’s interesting about all this is that Dublin is so very far north. It’s much farther north than, say, Fargo, North Dakota, where my friends have reported recent wind chills of minus 50 degrees Fahrenheit!?!! Yet it never gets that cold here! In summer, however, Dublin doesn’t get nearly as warm as Portsmouth. In 2003 Dave and I were in Ireland for the extended “heat wave” where temperatures reached 75 degrees Fahrenheit for at least two weeks. The humidity is terrible at home in the summer. But here, the level of humidity is always quite comfortable. The air doesn’t tend to hold a lot of water. When it reaches the point of saturation that would be uncomfortable to most people, it drops the water in the form of rain. 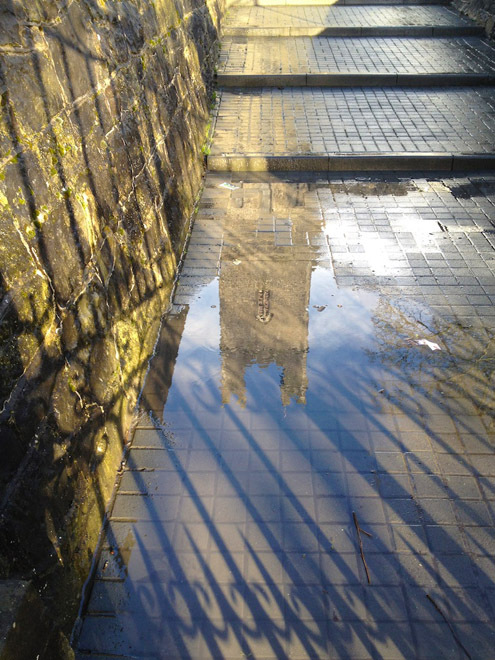 So, Dublin gets some rain most days, but the shower doesn’t usually last long. I don’t carry an umbrella because a lightweight coat and hat do a fine job keeping me dry. 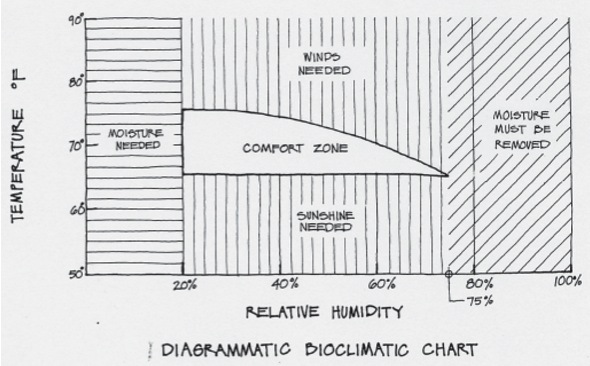 Based on the chart above (that I use in the Architectural Ecology classes I teach at Hampton University), the humidity level in Dublin must stay between 20-75%. Mother Nature must naturally remove the water as rain when humidity reaches a point over 75% here. How generous of her! 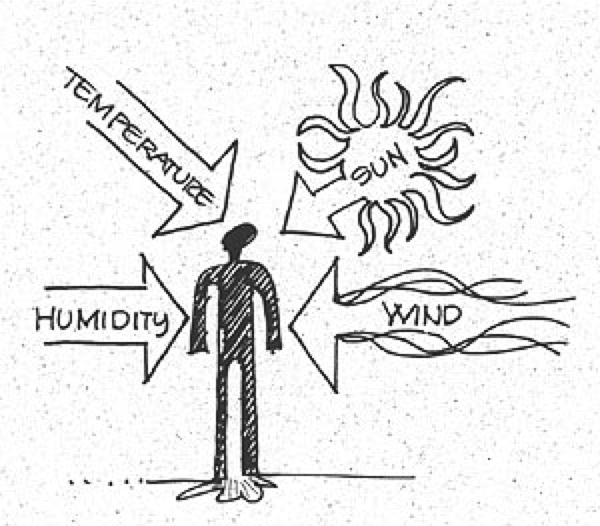 Overall, Dublin enjoys a pretty good balance of the factors show in the drawing to the right (humidity, temperature, sun, and wind). Incidentally, the humidity in this picture is from the warm, wet breath of people riding the bus this chilly morning. The wet air tends to get trapped inside the bus. And, it seems to be a bit more humid up top on the double deckers, perhaps because heat rises. A great benefit of all this is that my laundry almost always dries within the day when I hang it inside the apartment — I have a clothes dryer here, but thankfully no need for it! The air is dry enough here to absorb the water in the clothes as soon as I hang them. It takes much longer for laundry to dry in my house in Portsmouth, even when the air conditioner is running overtime to such the water form the air. Here, there’s no need for AC (except, of course, in buildings that were designed without regard for climate… who would overlook that!?! ).